A CAP TALLY MADE TO ORDER. BASEBALL CAP Braided Peak - Royal Navy. Belt - Royal Navy White Ensign. Webbing style belt with Royal Navy White Ensign flag badge -fits up to 46" waist. Bosun's Call only - Nickel plated. BRITANNIA TO BEIRA & BEYOND. Cuff Links - RN CPO. Cuff Links - RN Junior Rate. 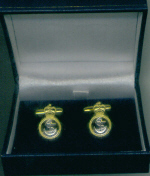 Cuff Links - RN Petty Officer. 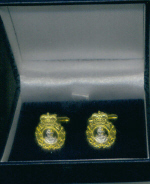 Cuff Links - RN Warrant Officer. Cuff Links - Royal Navy Officer. Cuff Links Port & Starboard. A great novelty gift - and there's some Port & Starboard Socks to match!! Please email me at navyblue346@aol.com if you wish to see pic. A2, (420mm x 594mm) 300gsm high white smooth matte paper. Limited Edition Print, signed by artist. Embossed with authenticity stamp. Presented in sealed clear sleeve and posted in 3in dia. cardboard tube with plastic cap ends. HMS ARK ROYAL - Zeal Does Not Rest 1981-2011 -. Limited edition of 75 prints, individually numbered, marked with embossed authenticity cachet and signed by the artist. Click on 'details' above for more information. HMS DARING & USS CARL VINSON. HMS DARING Sea Viper Launch.